How Low Would Price Have to go to Persuade Brazil to Reduce Soybean Production? As long as soybean prices stay between $4.50 and $7 per bushel, it appears that the area devoted to soybean production in Brazil has very little do with the level of soybean prices and acreage in the U.S.
Case in point: Brazil’s soybean acreage increased to a record level in 1999 (which is projected to be maintained or even increase in 2000) despite a 37 percent drop in soybean prices and a 10 million acre increase in U.S. soybean acreage between 1996 and 2000. If those changes haven’t slowed down Brazil, what will? Or to put the question in terms of a limbo bar, how low do we have to go to get the attention of Brazilian producers and persuade them to stop clearing new land and instead lower their soybean production? There are two ways in which future Brazilian soybean acreage could be affected by changes in soybean prices. One is the effect of price changes on existing acreage, the usual consideration. But in the case of Brazil, there is another very important acreage response question. What is the effect of soybean price changes on the rate at which reclaimed, unsettled land is brought into soybean production? With regard to land that is already under cultivation, Brazilian farmers’ land-use decision, even in the face of drastically lower prices, is the same as in the U.S.: they plant it! Regardless of prices, total cropland acreage changes very little in the short to intermediate run, with or without income subsidies. The level and type of income subsidies (emergency or otherwise) affects who will own the land and its price, but there is virtually no effect on the total acreage planted to crops (except in the long run, which is measured in decades not single years). In the case of Brazilian soybean acreage, there are opportunities for crop switching but public policy actions and investments have made soybeans a preferred crop. So, in addition to the tendency of total cropland acreage to remain relatively fixed under virtually all price regimes, Brazilian soybean farmers generally plant soybeans unless weather conditions intervene. So to have a measurable impact on future Brazilian soybean acreage, it will have to be on the rate at which reclaimed land is brought into production. In addition to the astounding fact that Brazil has 200 to 300 million acres of unsettled land that can be economically brought into production, there are also public policy reasons for the continued conversions to take place. Brazil made a decision over three decades ago to tie much of its economic destiny to soybeans. By focusing on soybeans, Brazil is addressing a number of policy objectives. For example, industrialization is stimulated because of the value-added processing requirements of soybeans. The nation’s diet is improved with greater availability of meat and poultry products and vegetable oil due to plentiful supplies of soybean meal and oil. Foreign exchange is saved because vegetable oil need not be imported as it was years ago and foreign exchange is generated by exports from the soybean complex. In accordance with the public policy objectives, the soybean industry is given special considerations including a publicly funded research program EMBRAPA (Empresa Brasileria de Pesquisas Agropecuarias), tax incentives that ensure that frontier land will be cleared within five years, changes in policy that moved from discouraging to encouraging imports, price supports and government market financing, a national rural credit system, uniform energy pricing policies that benefit agricultural production in the interior of the country, and public infrastructure programs. This combination of a ready supply of land and special public policy status works together to make Brazil a very competitive soybean producer. While we in the U.S. have long felt that we are the low cost agricultural producers, Brazilian cost of production numbers suggests that the United States does not hold the low-cost-producer title for soybeans. 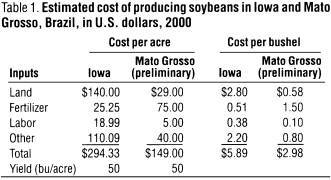 Agricultural economists C. Phillip Baumel, Marty McVey, and Robert Wisner provide a cost-of-production comparison between soybeans grown in Iowa and Brazil. Their chart is reproduced in Table 1. Source: Doane’s Agricultural Report, Vol. 63, No. 25, p. 6. Used by Permission. The biggest cost differential is the land charge with Iowa coming in $111/ac higher than Brazil. A significant portion of the cost differential could be erased with either a rise in the Brazilian land charge or a lowering of U.S. land values and cash rental rates. Working from the U.S. side, cropland values and rental rates would have to decline by more than three-fourths just to match Brazil’s land costs. In even the most agriculturally productive areas, a drop in cropland values of that magnitude would make the healthy balance sheets of today problematic. Land owners, the Farm Credit System, rural banks, farm equipment dealers, government coffers of rural school districts, counties and states would need to brace for a financial storm not unlike the one experienced in the late 1980s. Alternatively, U.S. producers could hope for a significant increase in the price of Brazilian land. However, the availability of vast amounts of suitable but undeveloped land will likely keep Brazilian land priced near the marginal cost of bringing new land into soybean production. There are other considerations, too. For example, even though fertilizer cost per soybean acre is currently about $50 greater in Brazil than in the U.S., the Brazilians are increasing their farm chemical production capacity and infrastructure for its delivery. So, the fertilizer cost differential is expected to narrow over time. In addition to higher fertilizer cost per acre, the Brazilians are also at a transportation cost disadvantage. The interior of Brazil lacks a full set of reliable highways and barge transport. In an article in the following week’s issue of Doane’s Agricultural Report, Baumel and McVey looked at that issue. The cost of transporting a bushel of soybeans from Mato Grosso, Brazil to northern Europe is $1.51/bu compared to $0.85/bu from Jefferson, Iowa to northern Europe. Here again, the Brazilians are working to improve their transportation infrastructure, and, over time, the differential will narrow and, perhaps, disappear. Adding transportation charges to soybean production costs generates a FOB northern Europe cost of $6.74/bu for U.S. produced soybeans vs. $4.49/bu for Brazilian produced soybeans, a difference of $2.25/bu. So, how low would we have to go? Well, with a differential of $2.25/bu for FOB northern Europe, to just match Brazil, the U.S. soybean price (in Jefferson, Iowa in this case) would have to be in the neighborhood of $3.64. The question then becomes: would driving soybean prices down to Brazil’s cost of production be sufficient to derail Brazil’s soybean-based economic development strategy? Bets, anyone?